Naturally I just had to had to try pimento cheese in ball form. The best part is that to reach the right consistency, you replace the mayonnaise with cream cheese — perfect for mayo-haters like yours truly. I debated rolling it in chopped pecans, but didn’t want to add the competing flavor. Plus, the red flecks of peppers are like Christmas confetti. Instructions: Let grated cheeses and cream cheese come to room temperature. Place in a medium-sized mixing bowl, add pimentos, salt, and pepper(s), and mix well with a spatula to combine. 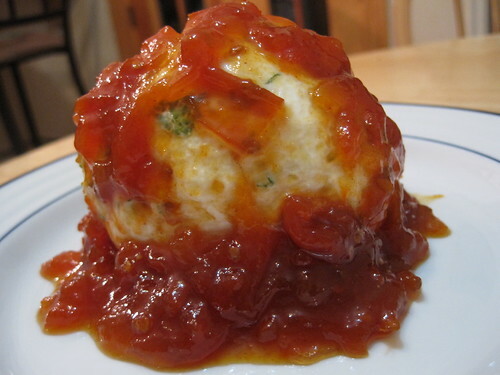 (You can also mix the ingredients in a food processor if you prefer.) Shape into a ball, wrap in plastic wrap, and refrigerate for at least 4 hours, preferably overnight. Enjoy with crackers and celery sticks. Two years ago, not long after Colleen and I launched C+C, we decided to mix things up for the holidays a bit and took a break from the Wine Spectator 100 Great Cheeses list to do two holiday cheese recipe posts. 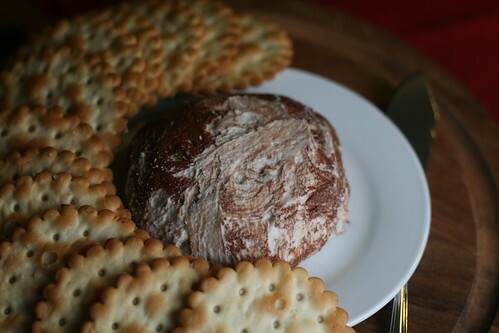 I wrote about the updated fondue I made for my family, and Colleen posted a recipe for a Chesapeake-inspired cheese ball. Little did we know that one post would generate close to half our blog traffic over the next two years. Y’all must love your cheese balls because you always seem to be searching Google for recipes! 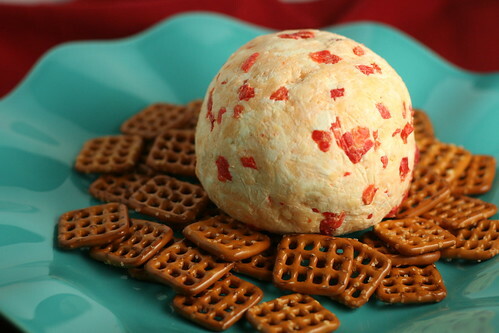 Our first featured cheese ball is a little low-brow (no fancy ingredients required) but still delicious. I wanted to create a latke-inspired cheese ball for Chanukah, hence the potato chip crust. And what goes better with potato chips than onion dip? I wasn’t sure how much onion dip mix to use and dumped in the entire packet, but if you don’t want the onion flavor to be quite so strong, I’d use half a packet. Serve with thick-cut potato chips or buttery crackers. Place softened cream cheese into a small bowl and mix in onion soup mix and shredded cheddar with a spatula until thoroughly combined. Shape mixture into a ball and wrap in wax paper. Refrigerate for several hours or overnight to set shape. When ready to serve, crush the potato chips with your hands (you want large chunks of chip, not tiny pulverized bits) and spread the crumbs onto a large plate. 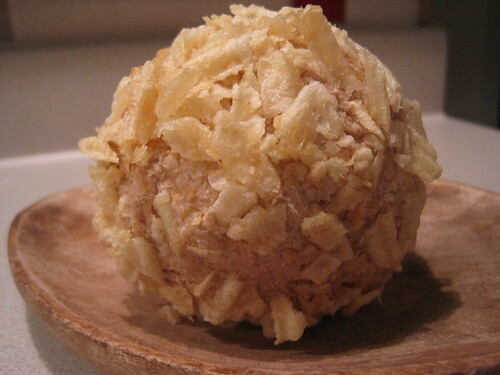 Unwrap the cheese ball from the wax paper and roll in the crushed chips until the ball is completed coated. Enjoy! * Though we believe our cheese balls to be original, we realize it is possible that someone else has created comparable recipes and we don’t want to appear that we’re stealing recipes. So please take our word that any similarities to already-published recipes are coincidental. It’s the last day of summer and fall is definitely in the air… and at the cheese counters, with cheddar, gouda and washed-rind cheeses settling in. Here’s what we’ve noted recently in the cheeseosphere. * American cheeses made their first trip to Slow Food Cheese 2009, the biennial celebration of the world’s finest cheeses in Bra, Italy, this past weekend. According to the reports, the Americans were greeted with much enthusiasm and sold out early. Congrats to Rogue Creamery, Cowgirl Creamery, Vermont Butter & Cheese, Uplands Cheese Company (and others?) who were represented. You can see gorgeous cheese pics galore here (though the text is in Italian) or review the full cheese participant list here. * Not Eating Out in New York provides a recap of the Brooklyn Cheese Experiment and includes the recipe for the judges’ first place pick, Bonnie Suarez’s Spicy 3-Cheese Crackers. * In the Washington, DC, region — the new FreshFarms Market by the White House features *four* local cheesemakers: Everona Dairy (VA), FireFly Farm (MD), Keswick Creamery (PA) and Clear Springs Creamery (MD). The First Lady’s cheese choice? Camembert from organic-certified Clear Springs; Agriculture Secretary Vilsack opted for their chocolate milk. The new fall class schedule is up at La Fromagerie; and CulinAerie will host a Cheese 101 class on Oct. 21. Visit our new “DC Cheese” event calendar to stay up-to-date on all the Mid-Atlantic cheese happenings. * In the Twin Cities, MN, region — Surdyk’s cheese sale continues till Saturday; France 44/St. Paul Cheese Shop is selling Rosh Hashanah sandwiches with local apples, honey and clothbound cheddar or Stilton (yum!). Visit our new “MN Cheese” event calendar to stay up-to-date on all the upper Midwest cheese happenings.